The Dow Jones Industrial Average Index – often referred to as just ‘the Dow’ – is one of the most widely quoted stock market indices. However, it owes its fame more to its age than its efficiency as a performance yardstick for US shares. When the Dow was born in the 1890s, computing power did not exist so the construction of the index was made deliberately simple: the index was the average of the share prices of each of the constituents. At the time there were only 12 companies in the index, but the count was increased to 30 in 1928 and that number has been unchanged since. The index calculation now needs adjustment to allow for company and constituent changes, but the average principle remains. That basis means that the higher a company’s share price, the greater is its influence on the index. Modern indices, such as the FTSE 100, operate differently, and constituent companies are generally weighted according to their market value, rather than their share price. Investment professionals view this as a superior approach which more accurately reflects how a portfolio would be created. 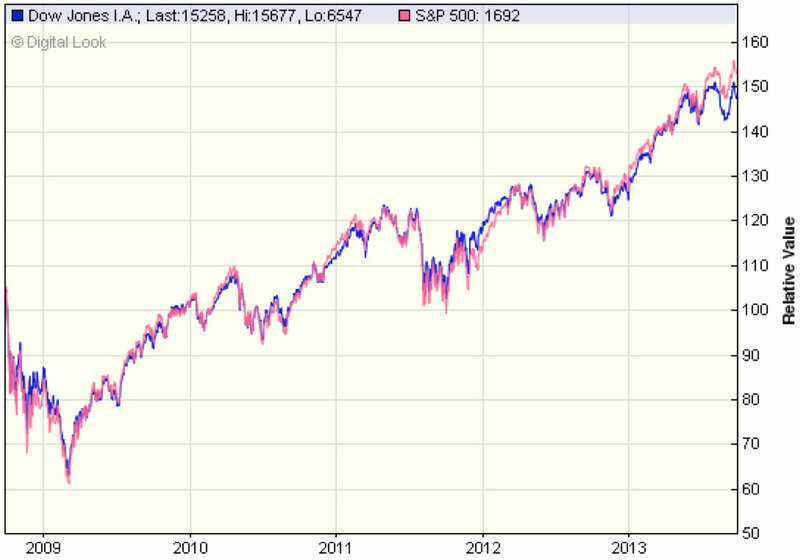 However, despite its antique crudeness, the Dow has closely tracked the professional’s US market measure, the S&P 500. The Dow’s average price approach meant that when three of the Dow’s constituents were replaced last month, some obvious candidates were rejected because their share prices were so high that they would have had an excessive influence on the index. Thus Apple – the largest US company – and Google remain outside the Dow (although Microsoft joined in 1999). The three new entrants were Goldman Sachs, Visa and Nike, ousting Bank of America, Hewlett Packard and Alcoa. As a result, the Dow will have a greater bias towards finance. ← How much income will you need for retirement?